Three eyes. Two tentacles. How many chuckles? 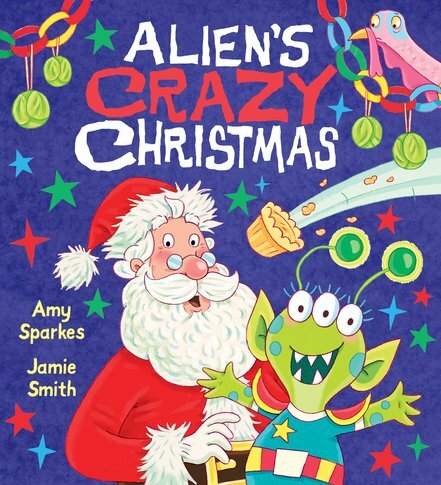 This little alien has got the recipe for a perfect Christmas (turkey, tinsel and presents) all mixed up! Christmas is great. Everyone thinks so. Including Zobble, who is visiting Earth. In fact, this little alien loves it so much he decides to take Christmas back home! He collects all the things he needs. Turkey. Pudding. Stockings. Presents. Crackers. Santa. But as Zobble’s shuttle blasts through space, things get muddled up! Pants stuffed with holly? A donkey in a fairy costume? Santa chasing a lost reindeer? Welcome to Christmas in space! You Can't Eat a Princess! Watch Out! There’s a Monster About!